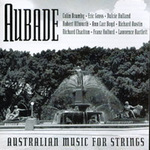 Aubade : Australian music for strings. Recorded/performed at: 2MBS-FM, Sydney., on 28 Jan 97. Robert Allworth Glenn Murray, Ann Carr-Boyd 3 mins, 8 sec. Recorded/performed at: 2MBS-FM, Sydney., on 28 Jan 97. Richard Austin Glenn Murray, Ann Carr-Boyd 3 mins, 38 sec. Recorded/performed at: Studios 301, Sydney, on 20 Jan 96. Lawrence Bartlett Lawrence Bartlett 2 mins, 16 sec. Recorded/performed at: 2MBS-FM, Sydney, on 28 Jan 97. Colin Brumby Glenn Murray, Ann Carr-Boyd 8 mins, 49 sec. Recorded/performed at: 2MBS FM, Sydney, on 28 Jan 97. Ann Carr-Boyd Glenn Murray, Ann Carr-Boyd 4 mins, 35 sec. Recorded/performed at: 2MBS-FM, Sydney, on 28 Jan 97. Ann Carr-Boyd Glenn Murray, Ann Carr-Boyd 5 mins, 55 sec. Recorded/performed at: Spiritwing Studio, Lane Cove, Sydney, on 28 Mar 96. Richard Charlton Sydney Guitar Orchestra, Christopher Keane 5 mins, 58 sec. Recorded/performed at: 2MBS-FM, Sydney, on 28 Jan 97. Eric Gross Glenn Murray, Ann Carr-Boyd 10 mins, 4 sec. Recorded/performed at: Grevillea Studios, Brisbane, on 14 Aug 96. Franz Holford Gary Williams, Betty Beath 2 mins, 22 sec. Recorded/performed at: Studios 301, Sydney, on 20 Jan 96. Dulcie Holland Dulcie Holland 3 mins, 29 sec. Score & Part: Autumn oaks : cello and piano / Franz Holford. Score: At the fountain / Dulcie Holland. Score: Images : three original works for guitar orchestra / by Ann Carr-Boyd, Richard Charlton, Christopher Keane. Score: Prelude for sunset / Robert Allworth. CD: Baroque angels : music of Australian composers / Colin Brumby ; Eric Gross ; Robert Allworth.